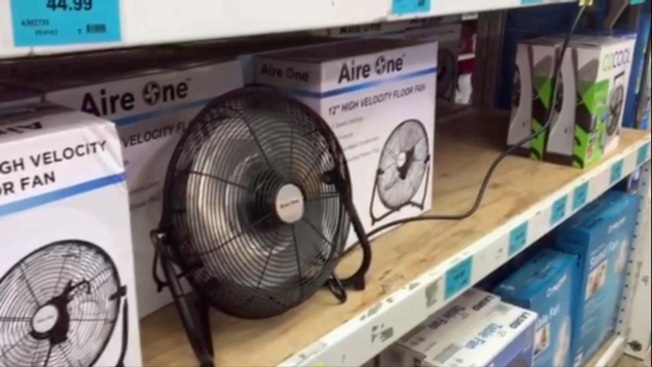 Record temperatures Sunday sent people scrambling to hardware stores and other retail outlets to buy fans and any other products that could provide relief from the sweltering heat. And with more sizzling days ahead this week, demand is expected to grow. One Ace Hardware store in Los Gatos sold 70 fans over the weekend. The manager said he hasn't seen demand for fans this high in 10 years. "A whole lot of fans, and we sold a lot of portable AC units," General Manager Justin Rosgen said. Seeking relief from 105-degree temperatures in Los Gatos, David Misson purchased two fans Sunday. Since he doesnt have air conditioning, he's hoping the fans will help keep his 3-week-old twins comfortable. "It is suffocating, really hot, oppressive," Mission said. "It's hard to get them to sleep period, but when it's hot like this, it's even more difficult. So I want to keep them cool." Beach umbrellas also were a hot ticket in the hot weather. And Ace Hardware sold nearly 20 kiddie pools. Some customers said they planned to use them to cool their pets. The Walgreens store in Los Gatos sold out of fans Sunday and had to restock. In the North Bay, Goodmans Building Supply employees said 85 percent of customers who entered the store Sunday bought fans. It may well be a great investment with several more days of record-breaking temperatures ahead this week.